Congratulations to the Oregon elementary chess players who participated at the USCF Elementary (K-6) Championships in Nashville, TN, last weekend. 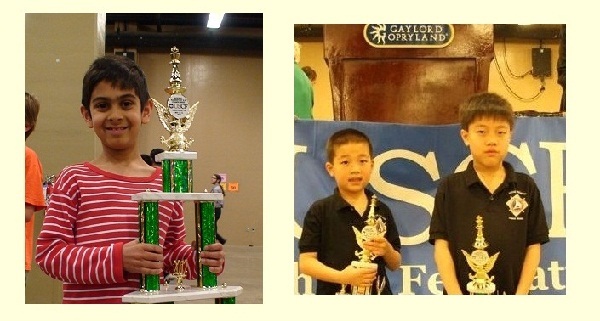 In the K-3 Championship section, Praveer Sharan (a Primary Elite co-Champion at Seaside) had 6 points after seven rounds, tying for third place overall, while Colin Liu (third in Elementary Elite at Seaside) tied for top honors in his class (USCF rating 700-799), with 4.5 points during the tournament. In the K-1 section, Kyle Liu (the other Primary Elite co-Champion at Seaside) won 5 points and his own National Championship trophy. Congratulations to all three of our Oregon participants! For those of you looking to become involved in the national chess scene, the US Chess Federation web site lists numerous national tournaments. Of particular note are two significant events coming in the next year: First, one of the premiere events of the US Chess Federation’s year, the 2012 U.S. Open chess tournament, is being held this coming August in Vancouver, WA. More experienced players can play in the main tournament (nine games, with schedules ranging from one a day to a three-day schedule), while scholastic players might want to try out the scholastic tournament to be held Aug. 4-5. Second, and of particular relevance to our scholastic players, next April 5-7 brings Supernationals V to Nashville, TN. Supernationals is a multi-day event combining all three major national scholastic championships (elementary, middle school, and high school) in one place — the Gaylord Opryland resort in Nashville. It’s the weekend before the 8th Annual OSCF State Championship in Seaside, so you’ll be able to attend both events!